When most people inherit their once-bachelor husband's furniture, they get leather couches, basketball posters, and the ubiquitous bean bag. I inherited a hideous 6 person dining table with grandma print chairs and gold trim. I mean really, what bachelor has a dinner party with their neighborhood ladies bridge group to warrant such a table? When I asked the hubster about it, he said they used it to play poker. Riiiight. So apparently, the neighborhood grandmothers have taken to playing poker. Nice. As soon as I saw that table, I promised myself it would never live in my house. Six years later, it still resides under my roof, mocking me with its faux wood trim. I recently put the table on Craigslist and was shocked my inbox wasn't flooded with people clamoring to buy my one of a kind table. You know an item is hideous when you don't even get the emails from the African princes wanting to buy your fantastic item for double the asking price (in fact, the cashiers check is already on the way). And so the table remains. And as much as I hate (really and truly HATE) to admit it, the table has come in handy in a hideous yet useful sort of way more than once. When we moved in to our new house and our movers "lost" our furniture, we were still able to have friends over for dinner because somehow, ugly table made it to the new place unscathed. When we had to host a family dinner, and we had unexpected guests, we simply added our equally ugly office chairs to the table for extra seating. Recently, we hosted a fall brunch and I admit I contemplated sticking the table in our backyard and pulling the blinds shut so no one would see the table in its gold trimmed glory. Until the hubster talked some sense into me. He convinced me our friends like us because of who we are and because we feed them good food, not because of the kind of furniture we have. Oh, and we needed the seating. And so, we brunched. We recounted stories of little man's escapades of the week. We drank too many cups of coffee. We laughed. We shared. 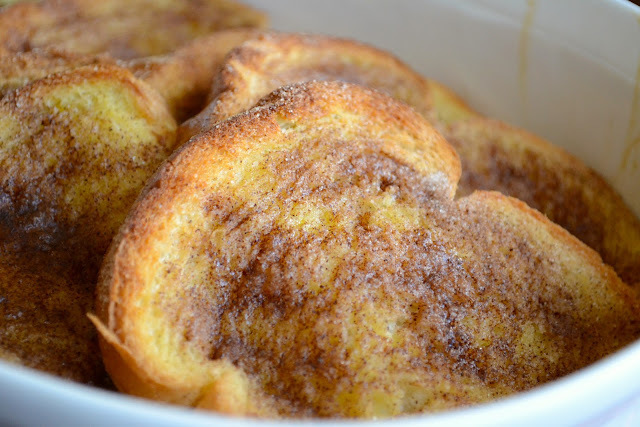 And most importantly, we ate more than our fair share of Pumpkin French Toast! 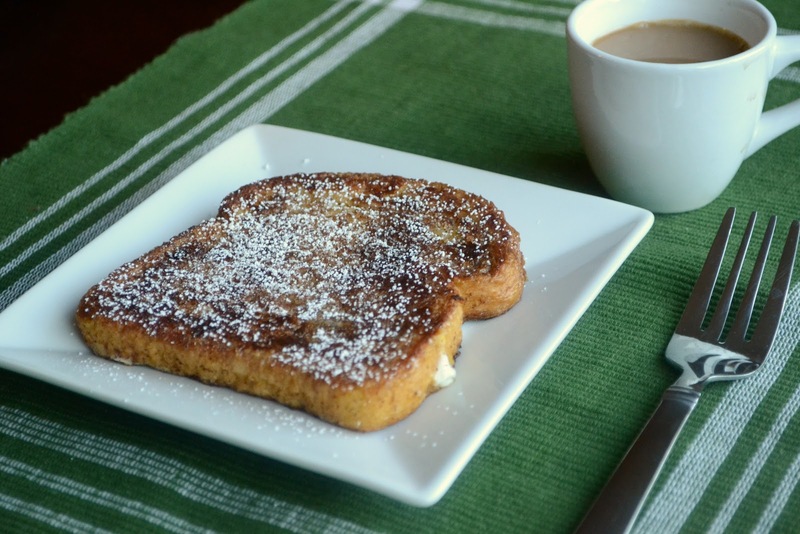 This is Smitten Kitchen's Cinnamon Sugar French Toast with a delicious pumpkin'y twist! Like all her recipes, it is gloriously adaptable. Only have sourdough bread on hand? No worries. Large group of hungry friends coming over? Double the recipe. Got a raging sweet tooth? Extra cinnamon sugar to the rescue. Want it to feel like fall? Add pumpkin to the custard. And after everybody went home, I made myself a plate of straight from the fridge French Toast and cozied up in front of my computer to catch up on my favorite blogs, like friends' pictures on Facebook, and pin random items on Pinterest. Oh, and repost that darn table on Craigslist. Preheat the oven to 450 degrees. Whisk the cinnamon and sugar together in a small dish. Line two large baking sheets with foil. Place the bread slices on the baking sheets in one layer. Spread each slice of bread with 1 teaspoon of butter, then sprinkle each slice with one teaspoon of the cinnamon-sugar mixture. Toast the trays of bread in the oven until the bread is golden, and until the cinnamon-sugar makes a caramelized crunch on top, for about 7 to 10 minutes. Reduce the oven temperature to 375 degrees and let the toast cool slightly. Generously butter a 9×13-inch baking dish. 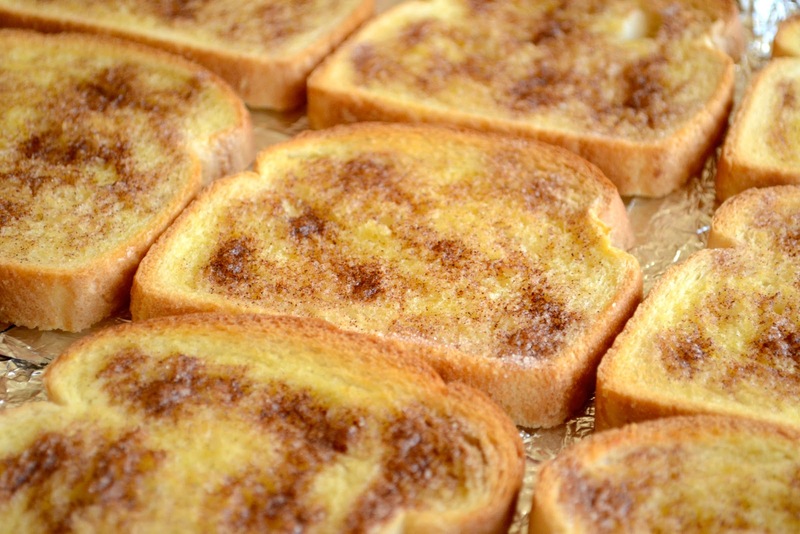 Arrange the cinnamon toast down in two rows along the width of the pan. Whisk the milk, pumpkin puree, eggs, salt and vanilla in a medium bowl and pour evenly over cinnamon toast in baking dish. Let sit for 15 minutes (or overnight, if you’re preparing this ahead of time) so that the custard absorbs a bit. Before baking, sprinkle any leftover cinnamon sugar over the French toast. Bake for 30 minutes, until puffed and golden and until no liquid seeps out of the toasts when they are nudged about in the pan. Now I want to see the table! Maybe you should turn some crafty person loose on your table. You could get rid of the gold trim and re-upholster the chairs. It's a good thing the french toast doesn't care that your table us ugly. Good food outdoes poor style. Why no picture of the table? I'd love to judge it's alleged hideousness for myself. But the truth is that we all have our own version of your table...mine is this cafe table in my kitchen. It's hideous but I can't seem to get rid of it. Not sure what the problem is? In any case, this French Toast would make me forget about any table, ugly or not. When I make it up to SF next I hope I get to partake?? So, we have this really cheap/ ugly/ horrible dining table which is fit for a bachelor pad and not my house. But my husband is absolutely against disposing it off. At least your table has some detailing ;) mine is plain wood and it sits like an elephant in the room. I have tried my best to cover it off but I know what sits underneath those covers. So I know what you mean. Ha ha, you know I happen to know someone who could transform that beast into a beauty for a nominal fee, lol. That God, my husband didn't have a bachelor pad before we got married, I can only imagine the horrors I would have to look at. Yes your friends love you for who you are, not what you have. Can't wait for those xmas cookies. I love how you built up the table and then, for some reason, you had something covering it in every shot ;) It seems like a hardy bit of furniture, one of those pieces that could survive a bomb and still be ok. We used to have this cracked brown leather chair that looked like little kids had been jumping on it because little kids HAD been jumping on it, specifically, my husband and his siblings when they were tots. I "gave" it to his brother a few years back and then felt really good about myself. This post made me laugh a lot. I'm so glad I found your blog. Where did all these posts come from?? I kept checking back for the longest time and then stopped...then all of the sudden asparagus! French toast! Glad you're back! Rachel, we'll have to do a blogger meetup so you can see the table in all its hideous glory! Ameena, I have seen pictures of your home and there is no way there is any ugly there. And yes, please visit, friend. We will make delicious food and chat up a storm. Gina, your crafting powers are awesome and I would be so intrigued to see what you would do with this giant beast of ugly table'ness. Can't wait to see you over the holidays! Muaaahhaa. I'm sorry I can't help myself. I read your comment and pictured my mom with that quirky lampshade on her head. I'm dying here. I'm home this morning and suspect that coconut water I had for breakfast may have been way too fermented. Excuse all inappropriate pointing and laughing. Hahha I wish you had posted a picture of the table, I'm sure it isn't as bad. Glad to see you back to posting. 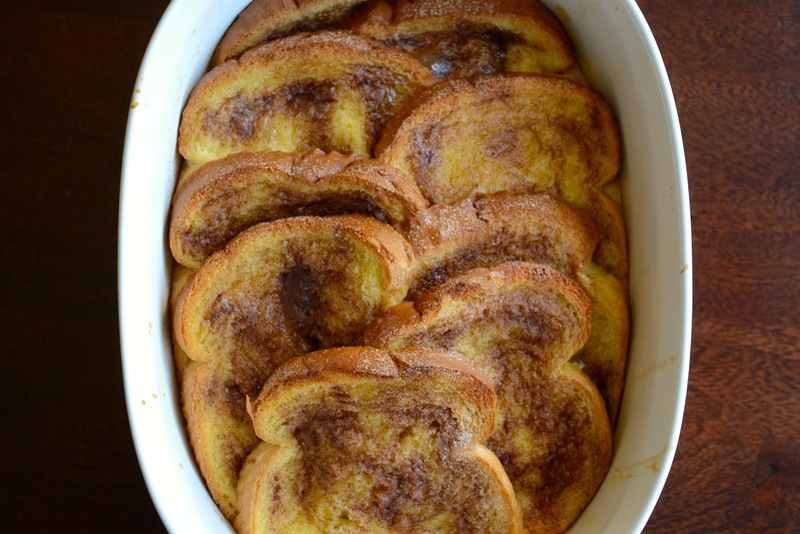 These french toasts look awesome, I have never baked one ever. now I am looking forward to see that table!